The facts: La Petite Robe Noire Eau Fraîche was developed by perfumer Thierry Wasser. It's described as a fresh green floral with notes of bergamot, mandarin, rose, freesia, jasmine, pistachio, almond, tonka bean, white musk and patchouli. Its juice is tinted green, and its bottle is the classic Guerlain silhouette tarted up with yet another little-black-dress illustration. I've tried La Petite Robe Noire Eau Fraîche/Ma Robe Pétales (can we just refer to it by the last three words?) a few times this week, and I'm still not sure exactly how I feel about it. In its opening phase, it feels more related to the 2012 La Petite Robe Noire than I expected: there's the cherry-cola accord, muted but still identifiable, and the hint of vanilla. What's new here is a blurry white musk that envelops everything else for a while, until it dissipates and allows the gourmand elements to emerge. As Ma Robe Pétales unfolds, the almond is more noticeable than the very subtle pistachio. For a perfume with "petals" in the name, this one keeps its flower notes under wraps — there's something in the heart that reminds me of lily of the valley, but otherwise just an underlying hum of soft white florals. And then there's much more white musk than I would have predicted; the dry down is mostly white musk and powdery tonka and almost-bitter almond, which is an odd mix of "clean" and edible notes. I was writing an e-mail to Robin when I was in a sarcastic mood the other day, and I referred to Ma Robe Pétales as "a stale pistachio macaron wrapped in a dryer sheet." I'm not going to take back that description, but I should add that I actually didn't mind wearing this fragrance. Faint praise, I know! There's something about it that puzzles and appeals to me, and I'll use up my sample vial trying to figure out why. Maybe I just like almondy notes, even when they're clouded over by fruit and musk? All in all, I'm wondering how Ma Robe Pétales will succeed at the perfume counters. It's really not "fresh" enough for young women who don't want to smell "perfume-y," yet it's probably not dense enough to please anyone whose was curious about the gourmand notes. For a springtime floral with a subtle edible note, I'd recommend Frederic Malle En Passant; if you really crave something nutty, try Parfumerie Generale Praliné de Santal. If what intrigued you specifically was the pistachio note, I know that Laura Mercier offers a fragrance named Crème de Pistache, but I've never tried it. And if you want a real green floral from Guerlain, you might as well cut to the chase and track down some Chamade. 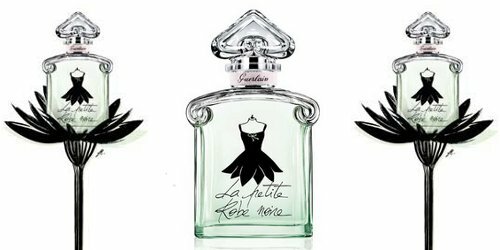 Guerlain La Petite Robe Noire Eau Fraîche is available as 30 ml, 50 ml and 100 ml Eau de Toilette. This doesn’t sound for me. The white musk will surely not agree with me. I may still sniff it though. I’d love to sniff a bit of pistache..I tried something called Iceberg or something at one time..didn’t smell any pistachio in it. Nor do I get pistache in Omnia Green Jade. Haven’t tried the LM but have wanted to here and there. Thanks for the review, Jessica! Yes, there’s quite a bit of clean musk, which is definitely something I have to be in a certain mood to wear! I like the pistachio idea… just sure this is really the fragrance that will please pistachio-lovers. I am one that is intrigued by the pistachio note alone. The rest of the fragrance doesn’t seem that inspiring (neither is the LBD on the bottle. I have to say it had already tired me out a looooong time ago!). I have tried Laura Mercier’s Pistachio. While I don’t hate it, I can’t say it’s an authentic pistachio. It is definitely a gourmand but at the same time quite synthetic to my nose; like some Philosophy bodywashes, yummy but fake, plasticky and cloying. Not resembling the rest of the Pistachio body products (body cream, wash etc. which are DELICIOUS.). But do give it a shot. Maybe your skin will have a better chance with it! I love a good almond note, and I will definitely sample the Ma petit yada yada petales But I’m not sure about pistachio. I had the Laura Mercier and loved it for about 10 days, then I started noticing a fatty note, something in it smelled stale and fat, like melted cheap ice cream. I had to sell it. Oh no! That’ s not good at all. I just popped into Urban Outfitters, a store that I really don’t like much in general, but I did notice a fragrance called Pistache Brulee for just $18. It’s the UR store brand. It smelled ok! That is, the UO store brand/house brand. Not a bad price..may have to smell it some time. Until then..I may just have to settle for eating Haagen-Dazs Pistachio ice cream..you know, to really get that pistachio note:). It may take a whole pint to really get that note though….;). Sounds fantastic! Can I join? Don’t worry, I will bring my own pint. I am also thinking maybe some Belgium chocolate note will compliment the nuttiness well. Yep, several of us miss the 90’s…there are restrictions obviously now that prevent some boldness I guess but ya, releases seem to be not as fab as they used to be. Idk. I do feel as though everything is being taken over by that white musk…it’s like The Blob…only…it’s white musk..which is worse. LOL. Music was better in the 90’s too..not the late 90’s though..but I digress.:). Things have definitely shifted. There are just too darn many fragrances being released, and too many of them are easily forgettable. I absolutely agree. It is such a shame really. Luckily some of the classics is still around and to be enjoyed and some niche lines also make some beautiful scents. But too many commercial releases are forgettable..désolé.. If you love pistachio notes (which I do), Dove has a magnolia and pistachio body wash that smells exactly like a big tub of ice cream to me! I do like the Laura Mercier pistachio products, but they are VERY expensive. The price is probably the reason I haven’t tried them!! I’ll keep an eye out for that Dove body wash. Thanks! The whole idea of La Petite Robe Noire should have been Chanel’s. Then we wouldn’t have this ridiculous gourmandy thing and its flankers pretending to be couture. HMMPH. Okay, tantrum over. And may I just say? Chamade is wonderful. Just wonderful. Why Guerlain is messing with this instead of promoting some of their other good things, I do NOT know. No, I totally understand how you feel. When I first reviewed LPRN, I complained that it made no sense for Guerlain, one of the few big perfume names *without* a couture house, to do a line with a dress theme, especially when the “little black dress” is a concept that’s been associated with Chanel since the 20s. Sigh. Why don’t they re-market Chamade to a new audience, with a new bottle and a new ad campaign? I have no idea, either. It’s just wrong for a perfume name to include both “Noire” and “Fraîche”! Didn’t there used to be a pistachio perfume on Luckyscent – part of a small line of gourmand perfumes no longer there? Not finding any reference to it. Nonetheless, in the course of looking for it, I realized that Marron Chic (in fact, the entire Nez a Nez line) is no longer on Luckyscent, but rather showing up on the discounters. So I just panicked-bought it from an Amazon associated seller. Thanks, Thierry Wasser – see what your meretricious flankers have driven me to? Yves Rocher did a limited-edition pistachio and cocoa shower gel a couple of years ago but it mostly just smelled of chocolate almonds to me. Maybe I just don’t really know what a pistachio smells like. They also apparently did a pistachio-vanilla scent in the late nineties but that of course is long discontinued. I need to visit the YR site from time to time. They do some fun scents, and the prices are so reasonable, especially during their frequent sales! Sounds like I’m definitely in the minority here, but I am a fan of the whole LPRN line. I find them to be delightful little treats and my favorite so far is the edp, I get compliments on it often. There’s nothing wrong with a simpler, light hearted fragrance, and they can be just as alluring, imo. I do look forward to trying this new version! I think LPRN has some fans here — UnseenCenser is very fond of the collection, iiirc. I have some other favorites in the simple, light-hearted category…like Tokyo Milk Waltz and Anjolie Ayurveda Full Bloom…and I do like Ma Robe Petales more than the other Petite Robes Noires! There are certainly some from the collection that I like more than others! So far I definitely enjoy the edp versions more than the edt. I actually was delighted to see this new green version out at Sephora today and tried it on my skin, so far, I quite like it. It is drying down nicely, doing better on my skin than the 2013 edt. I’ll have to check the Tokyo Milk Waltz the next time I’m at a Sephora, and if I ever come across the Anjolie brand! Did I mention I deeply disliked all the later Guerlain entries and I deeply dislike Thierry Wasser? The last Guerlain I was pleased to smell was Mandarine Basilic which is okay and fun. It is a pity that Guerlain does not offer anything interesting anymore. The opening actually reminded me of Nina Ricci’s Fantasy – just less sweet and fruity (not that it isn’t sweet). When I wore LPRN eau Fraiche, all I got was vanilla and musk once it dried down, I’m surprised you managed to get the almond and tonka (what I had hoped for).